Watch Steve Skate. Watch Steve Break. Poor Steve. How well does the Lexus LS 600h's Active Pedestrian Detection System work? Allow Consumer Reports and its levitating test dummy "Steve" demonstrate. CR has some cool toys. In this case it's Steve. Steve is designed to test the pedestrian detection systems currently on offer from Lexus, Mercedes-Benz, and Volvo, with a rig pulling him into harm's way and a pair of brushes to keep him skating across the pavement. The systems from Mercedes and Volvo use modified radar sensors normally designed for adaptive cruise control to keep you from mowing down an old lady. 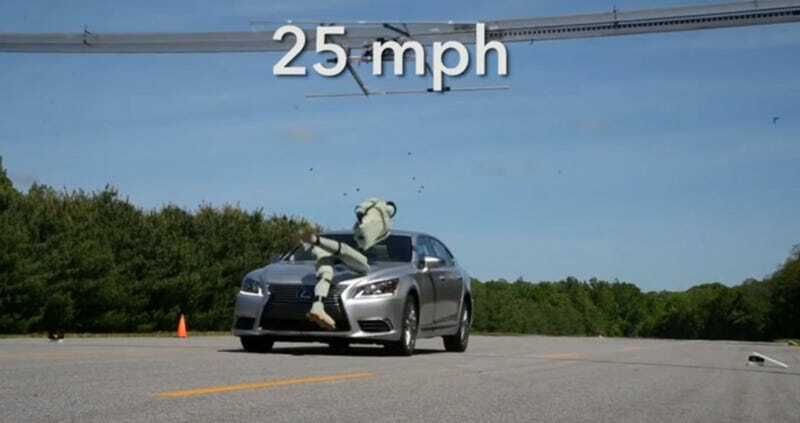 Lexus does the same thing, but incorporates a pair of cameras to identify pedestrians before applying the brakes. And it works. At least, most of the time. Lexus says the system is good up to speeds of 24 mph, and CR tested it at 25 mph with the LS stopping just short of the dummy. However, one 10 mph run proved – once again – that these systems aren't up to snuff 100 percent of the time.